A major fire tragedy was averted today as a Gujarat-bound truck (RJ-19 GD 1550) caught fire near Guru Ravidaas Chowk. While any entrance test being hosted in the city inevitably means traffic jams, the JEE advanced test also witnessed a similar scenario here today. Even though it has been more than a year since the Punjab and Haryana High Court had passed orders that only recycled water should be used for construction purposes with directions to PUDA and the state authorities, none of the civic bodies have come up with any plan for the purpose. In the past decade, various civic bodies have constructed several flyovers and overbridges to help commuters zip through the congested areas or move past the railway tracks without any hurdles. With Congress candidates winning in most cities, including Jalandhar, Ludhiana and Amritsar, and wife of Deputy CM Harsimrat Badal making to Parliament on a slender margin of 19,000 votes from Bathinda, Congress councillors here are sceptical that the government might delay bypoll to ward 49 here. The Jalandhar District Brick Kiln Owner’s Association today said all brick kilns in Punjab would stop functioning and hand over the keys of their establishments to Punjab Chief Minister Parkash Singh Badal if the district administration failed to resolve their issues. CT Institute of Hotel Management (CTIHM), in association with the Punjab Heritage Tourism Promotion Board (PHTPB), held a programme at Kartarpuria da Dhaba and Vaishali Dhaba, situated on the Kartarpur highway. Jalandhar: Students of Class I and II of Eklavya School participated in “Enact your favourite advertisement” competition. They presented various advertisements on Lifebuoy Sanitizers, Oreo biscuits, Maggie, Bournvita, Tang, Pepsi IPL, etc. Director Seema Handa, manger Sapna Bakshi and principal Dimpal Sharma appreciated students for their efforts. The truck was overloaded with dry coal that started burning due to friction after coming in contact with overhead high-tension electric wires. It was immediately driven to the 120 feet road nearby and the Fire Department managed to control the situation after reaching the spot on time. The truck, along with two more vehicles accompanying it, have been fined for overloading by the traffic police. “We received a call at around 1:55 pm about a truck engulfed in flames near the 120 feet road. We immediately rushed two fire tenders along with four firemen to douse the flames. On reaching the spot, it was found that since the trucks were overloaded with dry coal, they were touching the high-tension electric wires for long. This could have initiated a spark amongst them that flared up with time,” said Rajinder Sharma, sub-fire officer, Jalandhar. He also said that it almost took an hour to control the fire that almost engulfed 30 to 35 sacks of coal placed in various rows on top. According to witnesses, the truck had entered the city through Guru Ravidas Chowk. 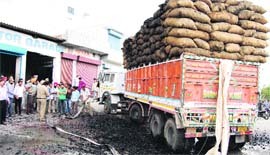 Near Basti Shekh Adda, the two trucks moving behind saw some sparks coming out from the top few sacks that were touching the high-tension wires. They immediately alerted the driver who, in turn, called the fire station. Nearly 450 students appeared for the JEE advanced exam held at Lyallpur Khalsa College. While there were a total of 484 candidates, 20 did not appear. 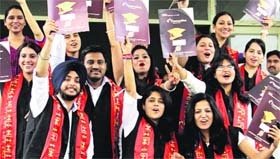 Khalsa College was the only centre for the exam in the city. While the exam was held in two shifts, traffic remained blocked for nearly half an hour in the evening after the evening shift exam, as the vehicles of parents waiting for their wards to come out created a blockade on the road. Clearly, no lessons were learnt from the blocks created at various places during the AIPMT exam held a few days ago. 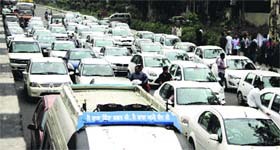 Vehicles stayed parked bumper to bumper, as the road was jammed and as a result, the highway traffic also suffered, inconveniencing many commuters and passersby. “However, all we can do is to appeal to institutions to inform us in time so that we can make arrangements prior to the event to re-route traffic through some other way to avoid trouble to commuters. In the case of Lyallpur Khalsa College, even that couldn’t have been done because it is the highway,” he added. PUDA and the state authorities had also been told to adopt some procedure and monitor the same. Since there are no pipelines coming to the city for the use of treated water from the sewage treatment plant at Pholariwal village or any water tanker facility available from the plant, the builders say they are helpless on this front and have been continuing to use potable water for construction illegally. The court had even asked the Chief Secretary to issue directions to all the deputy commissioners to verify the facts and take action on the basis of the directions issued by the Central Ground Water Authority, Ministry of Water Resources and Ministry of Environment and Forests to preserve groundwater. After the court orders, the Local Bodies Department had issued orders against the use of potable water for construction, but with no check on its implementation. The DC had then appointed Joint Commissioner for the monitoring of the directions for which there has been no headway with most officials terming it as an impractical order. At the plant, the treated and the untreated water are being discharged together with discharge flowing down to Kala Sanghian drain. A PIL on the matter had been filed by lawyer HC Arora. The case pertains to the non-implementation of the restriction on the use of groundwater in notified areas of Punjab. It had been pointed out that the Central Ground Water Authority, under the Ministry of Environment and Forests, Government of India, had declared 45 areas in Punjab as notified areas through various notifications with a view to protecting and preserving groundwater resources. There are about 670 commercial and residential establishments which have installed borewells on their premises. A year after the court had directed that meters be installed with all borewells, it is now that Jalandhar MC has started issuing notices to the connection holders for the same. The court had said, "The builders can be asked to put water meters on borewells as per the directions issued by the Central Ground Water Authority, so as to ensure the quantity of water extracted. The water can be extracted only for the purpose of drinking and not for construction. The PUDA and state authorities had even been asked to submit a detailed report in this regard. Even as the bylaws of the MC and the Punjab Urban Planning and Development Authority (PUDA) Act stipulate that rainwater harvesting plants have to be installed in all commercial buildings, the orders are not being complied with, for which again directions for proper implementation had been again passed by the court. The court had said that provisions for the installing of rainwater harvesting system should be followed as per Rule 45-A of PUDA (Building) Rules, 1996 issued on August 25, 2010. SE (O&M) PS Jaggi said, on an average, five to six tankers were filled from the plant by builders on a fee of Rs 100 per tanker for which record is being maintained by the staff of the Punjab Water Supply and Sewage Board. He said a public notice had been issued in this regard. "We have been sounding off owners of big projects like malls and hospitals to use water from treatment plant only for construction," he said. In the past decade, various civic bodies have constructed several flyovers and overbridges to help commuters zip through the congested areas or move past the railway tracks without any hurdles. But little effort has been made to develop the vast belts under such bridges aesthetically or put them to any use. Several plans have been made, but only to be shelved. Huge stretches under the overbridges have been illegally encroached upon by taxi stand owners, roadside vendors, private bus companies and even adjoining automobile showroom owners for displaying their new two wheelers. With a little planning and no effort to use such areas, the Municipal Corporation has virtually turned all these points into big eyesores for the passersby. There were plans to have a green belt on the vacant space underneath bridges, which have fast moving traffic around and creating of parking lots for taxi stands in the other stretches around which the movement of traffic is negligible and slow, but nothing has been done for the past five years. The area in front of the bus stand underneath an approach road coming from Lyallpur Khalsa College overbridge is perhaps the shoddiest of all places. Though the MC invested a huge amount in creating a huge platform for parking of vehicles by covering it with interlocking tiles, the effort seems to have just gone in vain as the space has been allowed to be encroached by anyone. The area closer to the railway track has been encroached upon by the Indo-Canadian Bus Service, which has its office just across the track. Four to six buses of the company remain parked under the bridge during the day along with a police vehicle as part of a security measure. Move a little away from tracks and two taxi owners have already occupied the site for free. Tiles had been put up to shift irregular taxi stands near Namdev Chowk to this side by levying a fee on them. Some new companies have come here on their own. They have not been paying even a penny to the MC on this account. There are also some abandoned, dust-laden vehicles dumped here, which have not been lifted despite passage of so many days. No check in the area has provided an opportunity to the people to encroach on the available land without any fear of law. Inch a further closer to the bus stand and one can find vendors doing brisk business by offering snacks to daily commuters under the shade of a bridge. 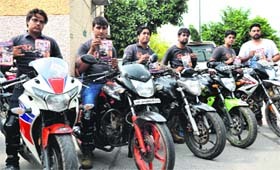 The part of the stretch in front of the gates of the Punjab State War Memorial is used by a two-wheeler showroom close by to display new unloaded bikes for sale. Huge containers in which the automobiles are brought to showrooms are also parked at the site to take advantage of the bridge making up as a covered shed. Move further and there are auto-rickshaws and rickshaws parked underneath the bridge in a haphazard manner making it difficult for pedestrians to cross to the other side. On July 19, 2011, then Mayor Rakesh Rathour, had laid the foundation stone for a greenbelt under the stretch of Lyallpur Khalsa College railway overbridge and BMC Chowk flyover. Presently, there is a large stretch of barren land instead of a green cover. As per the plan, the entire stretch underneath the Lyallpur Khalsa College railway overbridge and the BMC Chowk flyover from BSF Chowk to BMC Chowk was to be interspersed with parking areas and green belt. A part of the parking lot is being used by the auto-rickshaws for free despite the MC plan to auction the parking site so as to earn an additional income from the taxi stand owners or parking contractors. Rathour had even got designs prepared for the stretch, but no follow-up of the project was undertaken by his successor, who was also from the same political party. A few palms, perennial and aesthetic shrubs had been planted underneath the far end of the BMC fly over in front of Radisson Hotel in the name of green belt. Several seasons have passed, but MC officials have failed to improve the look of the area, which is otherwise covered by police sheds and advertisements on pillars of the bridge. Amardeep Samra, who owns a commercial building near BMC Chowk, said he and the owner of other buildings around the site had proposed that the stretch of BMC Chowk flyover descending towards Apeejay College be used for parking. “There is a lot of parking problem in the area and we can help the MC get a contractor for managing parking. This will reduce hassles for daily visitors to banks and other places in the vicinity to a great extent,” said Sharma. A part of the stretch underneath the railway overbridge on Lyallpur Khalsa College side and Domora railway overbridge has been used for construction of MC-run night shelters. It, however, is a separate issue that the MC has not been able to run the night shelters properly with very few takers even in the peak winters. The shelters have just come up as to show compliance with the Supreme Court orders in this regard. The area under Domoria railway overbrige is the biggest eyesore with anti-social elements flocking around the railway station, misusing it for all the wrong reasons and making it extremely unsafe for passersby in mornings and evenings. Several persons keep on squatting under the bridge with their bag and baggage throughout the day. The area is also unclean. Earlier, it was proposed that the area under the DAV College railway overbridge be used for shops. The project, which was planned in 2006 during the signing of contract for construction of the bridge, has not materialised till date. Residents in the area around the bridge said it was rather a good proposal to have shops under the bridge, which could have put the stretch to optimal commercial use. Hundreds of students from educational institutions in the vicinity would have got food, stationery and other items required by them. The problem of maintenance in the area and checking of encroachments could also have been done away with, said Reena Bhagat, a resident of Kabir Nagar. The ward had fallen vacant after Congress councillor Sharwan Grover had passed away on July 30 last year after illness. It has been now nearly 10 months that there is no representative from the ward. The situation has forced residents of Nijatam Nagar, Tej Mohan Nagar, Ashok Nagar, New Ashok Nagar, New Sant Nagar, Basti Nau, Adda Sheikh, Basti Mangu and Narain Nagar to visit the councillors from neighbouring wards for getting their documents attested.The residents have also been fuming that there is no councillor to represent their problems for the past 10 months. It was earlier being expected that the government would announce bypoll to the ward and the pending MC elections in Bathinda, Phagwara and Pathankot soon after the Lok Sabha polls, but the results went otherwise. The Congress councillors are now apprehensive that the elections which were due in these areas are likely to be delayed for some months till the government manages to get some development done and earn some goodwill from the voters. Leader of the Opposition in the MC Jagdish Raj Raja said ideally elections should have been held in six months. "But then the Lok Sabha polls came in between. After seeing Jalandhar candidate losing by 70,000 votes and Mayor Sunil Jyoti and SAD-BJP councillors themselves losing from booths of their wards, the SAD-BJP might strategise some delay in bypolls," he said. Senior vice-president of the association, Ashok Mittal, said certain people belonging to some labour unions in Nakodar, Mehatpur and Shahkot had been instigating labourers to stop work in protest against lower wages. Consequently, the entire brick kilns in the state had not been functioning since May 17. He said due to unexpected rainfall in the region for last couple of months, work was already suffering. The labourers working in brick kilns were being threatened and pressurised by labour unions to organise protest against the owners, said Ashok. He said labourers were already being paid 30 per cent more than the minimum wages recommended by the government. As per the government’s minimum wages policy, the labourers are supposed to get Rs 484 for 1,000 bricks. The labourers are being paid Rs 620, including 8.33 per cent bonus in brick kilns functioning from Nakodar, Mehatpur and Shahkot. He said the matter was taken up with the district administration several times, yet nothing had been done to redress their problems so far. They were going to meet Jalandhar Deputy Commissioner Varun Roojam tomorrow to get the issue solved, added Ashok. The CT Group of Institutions has been assigned the job of spreading hygiene, hospitality and food awareness among roadside eateries as part of a project introduced by the Punjab Heritage and Tourism Promotion Board (PHTPB). Under the state government’s first-of-its-kind initiative in the city, the project called ‘Project to upgrade roadside eateries’ (PURE) was inaugurated yesterday at two dhabas by the PHTPB at Jalandhar-Kartarpur National Highway-1. “This is basically a Central government project and we (CTIHM) are affiliated with the Ministry of Tourism, Government of India. Under the project, we have been asked to visit a number of dhabas and dole out hospitality, hygiene, bio-waste management, working skills lessons to staff working at dhabas and also keep an eye on their manpower. There are many dhabas on the highway, but not all are in best condition. The initiative will help upgrade these dhabas as per standards set by the government,” added the principal. The winners of the competition are: Maanya Jaiswal (first), Aarush Wandhawan (second), Guneet Kaur (third). In happy grams: Satvik Sharma, Shaurya Angrish and Kanika from Class I (first), Asees and Ruhani (second), and Armaan (third). Chander Mohan has been unanimously elected president of the Arya Shiksha Mandal for the sixth term for the next three years. Arya Shiksha Mandal is a 100-year-old educational society running five institutions of higher education at both college and school level. Kanya Maha Vidyalaya, Doaba College, Sanskriti KMV School, Jullunder Model School, Dev Raj Senior Secondary School and Dev Raj Public School are being run by the governing body of this society. Mohan has been leading the Arya Shiksha Mandal as president for the past 20 years. The governing body of Arya Shiksha Mandal and all members elected Chander Mohan at the annual meeting of the body held on Sunday. Alok Sondhi, Dr Sushma Chopra, KMV principal Atima Sharma, Dr Naresh Dhiman, principal, Doaba College and other members congratulated Chander Mohan on his re-election as president. An eye and dental camp was organised by Kulbir Kumar and Bavnesh Kumar, manager, Smile Foundation at Sahibzada Ajit Singh Ji Public School, Sarhali. The special camp was headed by Dr Rajan (MSMBBS), Deepak Panday, Dr Kiran, who were assisted by their professional teams. Dr Rajan also shared his views with students in the school assembly on “How to protect eyes and teeth”. President Harminder Singh, director Raghvir Singh Chahal and principal Jatinder Kaur thanked the Smile Foundation and the team of doctors. and send their views to: Feedback, Jalandhar Tribune, Sector 29, Chandigarh - 160029. Letters sent by post must mention 'Feedback for Jalandhar Tribune' on the envelope and must contain the address and telephone number of the sender.